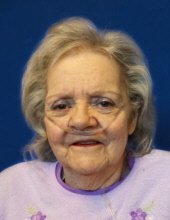 Anita Louise Branum, 77, of Upland, CA, formerly of Palestine, IL, died at 3:42 a.m. (PST) on Tuesday, April 2, 2019 at the San Antonio Regional Hospital in Upland. She was born on December 14, 1941 in Palestine, IL, the daughter of Ray Adams & Ethel (Brashear) Adams, both of whom preceded her in death. She was also preceded in death by her step-mother, Eileen (Pierson) Adams; by her brother, Alan Adams; and by her niece, April Strange. She is survived by her son, Rodney Lee Branum (Sandpoint, ID); by her daughter, Frances Louise Huerta (Upland, CA); by her grandchildren, Kevin Branum, Amy Branum, Scott Branum, Mac Huerta, and Alex Huerta; by eight great-grandchildren; by her brother & sister-in-law, Leo & Phyllis Adams; by her sister-in-law, Shirley Adams; as well as a niece and nephew. Anita was born and raised in Palestine, IL and was a 1960 graduate of PHS. Sundays often found her in the Palestine First Christian Church, where she would hold her membership for the rest of her life. She eventually moved to Upland, CA, a place she’s called home for the last several years, 35 of which were spent serving on the Upland Housing Authority Board. Much of her free time was spent cross-stitching, and this provided her with countless hours of enjoyment. It didn’t take any length of time with Anita at all to recognize that her family was her life, and her grandchildren in particular held a special place in her heart. She was a strong, but compassionate woman whose legacy of love will live on for years to come. Graveside services will be held at 1:00 p.m. on Friday, April 12th at the Palestine Cemetery, with Celebrant Curt Goodwine officiating the service. Memorials may be made to the “Rady Children’s Hospital-Pediatric Specialty Care”. Envelopes will be available at the cemetery, and donations may also be made online at www.radyfoundation.org. The Goodwine Funeral Home in Palestine is in charge of arrangements. To send flowers or a remembrance gift to the family of Anita Louise Branum, please visit our Tribute Store. "Email Address" would like to share the life celebration of Anita Louise Branum. Click on the "link" to go to share a favorite memory or leave a condolence message for the family.